Fiorina 161’s oppressive and bleak beachside is attended by creaking, derelict cranes and structures, manned only by prisoner labour whenever the surface is intermittently hospitable. “The E.E.V tumbling end over end as if unguided and out of control, within the pull of Fiorina’s gravity field,” reads one draft of Alien 3. The escape pod burns through the stormy sky, observed at a distance by prisoner Clemens, “gaunt in a way that suggests the years have been filled with suffering of a kind we are never meant to wholly understand … Wind whips at his plastic protection. At his feet, the dark sand is alive with tiny iridescent insects.” The E.E.V turns white-hot, flares through the clouds, and “disappears over the horizon line of a black sea in a turmoil of whitecaps.” Ripley has arrived. Like Acheron/LV-426 of Alien and Aliens, Fiorina 161 is unfriendly or at least indifferent to its human inhabitants. Grey and grim with roiling stormclouds and rust-tipped mountain peaks, the only organism crawling its surface apart from the few humans we encounter in the movie are swathes of lice, whose presence necessitates that the human population shed their hair and adopt an impersonal and uniform look. Oxen -beasts of burden- are apparently brought in for a lifetime of toil and a destiny in the prison’s meat locker. Fiorina is Hell by night and Limbo by day. ~ Michelle Moen, Alien 3’s Matte Dept. Supervisor. 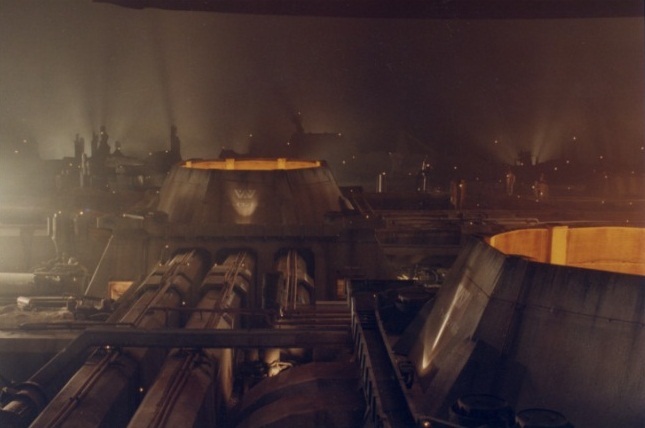 In a nod to other cinematic landscapes, matte painter Paul Lasaine added to his painting of the Fiorina refineries [image at the top of the page] distant towers styled after the stacks from Blade Runner‘s famous ‘Los Angeles 2019’ opening shot – details which you’re unlikely to have a chance of spotting in Alien 3 due to the overlapping effects and the diminutiveness of the painted towers. Allegedly, the Tyrell Pyramid structure is also in there, somewhere. An obvious similarity with another cinematic alien world is Fury’s twin suns – perhaps a tip of the hat to Star Wars‘ Tattooine sunset. 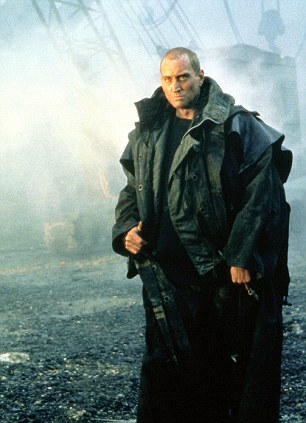 The shores of Fiorina were filmed on the dreary Blast Beach at Seaham and at Blyth Power Station – perfect for the planet’s monochromatic landscape, and was apparently shot by Jordan Cronenwerth [Blade Runner again] before he left the production. ~ Rich Fitcher, Boss Effects Co-Supervisor. “Deep space on this particular planet is not zip-fasteners and lycra,” explained Charles Dance, who plays Ripley’s seaside saviour, Clemens. “The look is deeply depressing – very gray, underlit and somber … [The prisoners are] a pretty sad lot, but they’ve all managed to survive long-term imprisonment against all odds in this dreadful environment.” For the shots of Clemens wandering the dust-swept planet, a facility set was built on a studio backlot. ~ Charles Dance, Fangoria, 1992. The bulk of Fury’s exterior scenes were filmed but ultimately cut from the theatrical release, though they were restored to the 2003 Assembly Cut. These included Clemens discovering Ripley washed up on the beach, carrying her back inside the facility, and the prisoners utilising oxen to haul the E.E.V. from the sea. ~ Terry Rawlings, Alien and Alien 3 editor. Because they wanted the hellish landscape to have depth, a matte painting was dismissed and a set built with a shoestring budget attached. Forced perspective gave the added depth necessary and the crew smoked up the studio for a hellfire vibe. Hell by night. The shots of the smouldering prison facility and its furnaces were inspired by the opening shots of Ridley Scott’s Blade Runner.